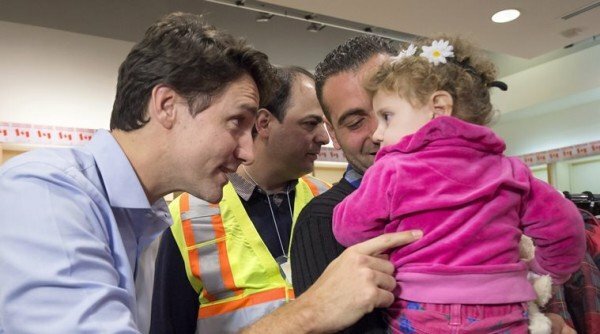 Canadian PM Justin Trudeau has welcomed the first 163 Syrian refugees to his country. The first military plane carrying Syrian refugees has landed at Pearson on December 10. Justin Trudeau said Canada was “showing the world how to open our hearts”. The newly elected Liberal government has pledged to take in 25,000 refugees by the end of February 2016. Canada’s stance on the issue differs sharply to that of the US, which has been reluctant to take in refugees. Another military plane is due in Montreal on December 12. Immigration Minister John McCallum said all 10 provinces in Canada are in favor of accepting the refugees. “This is a great moment for Canada,” he said. The Toronto Star, Canada’s largest-circulation daily newspaper, ran a cover story on December 10 welcoming the refugees. About 800 refugees are going through screening tests in Lebanon and Jordan daily, John McCallum said. Justin Trudeau, who swept the October 19 Canadian elections, has a different stance on refugees from that of his predecessor, the conservative Stephen Harper, who did not wish to resettle more people. Unaccompanied men will be excluded from the resettlement program, but officials said this had nothing to do with national security concerns. “We want them to have a roof over their head, and the right support,” said John McCallum.